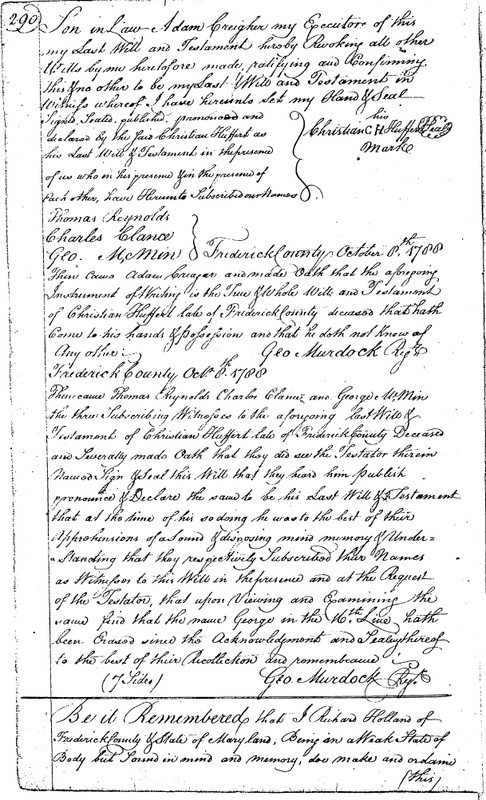 Listed below are resources for genealogists working the descendants and ancestors of Christian HUFFORD, born 1716 in Schwaigern, Germany, and died 1788 in Frederick Co., Maryland, USA. Christian was the son of Hans Jorich HOFFART (b. 1674) and his wife, Anna Margaretha MOST (b. 1675). Christian arrived in Philadelphia in September 1729, with his parents and his nine-year-old sister Anna Margaretha. Christian’s sister Anna Christina (b. 1706) arrived soon after with her husband, Johann Casper CREAGER, and their newborn son (Philip Casper Creager). Christian married twice, had seventeen children, and died in 1788 in Frederick County, Maryland, USA. The name is spelled several ways, including at least the following: Hoffarth, Hoffart, Hoffert, Hofford, Huffard, Hufferd, Huffert, Hufford, Huffort. 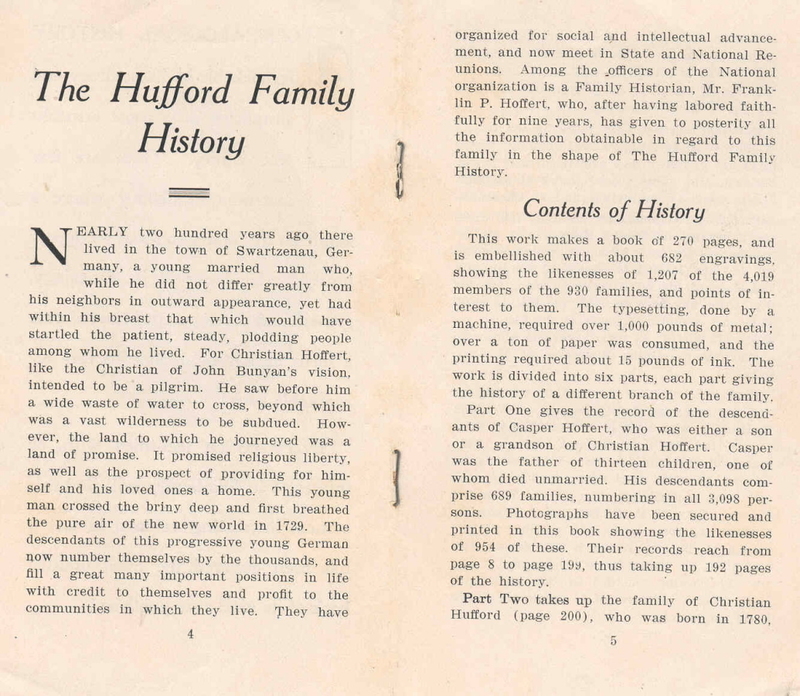 The 1909 HUFFORD FAMILY HISTORY, in a PDF file, at an LDS site. 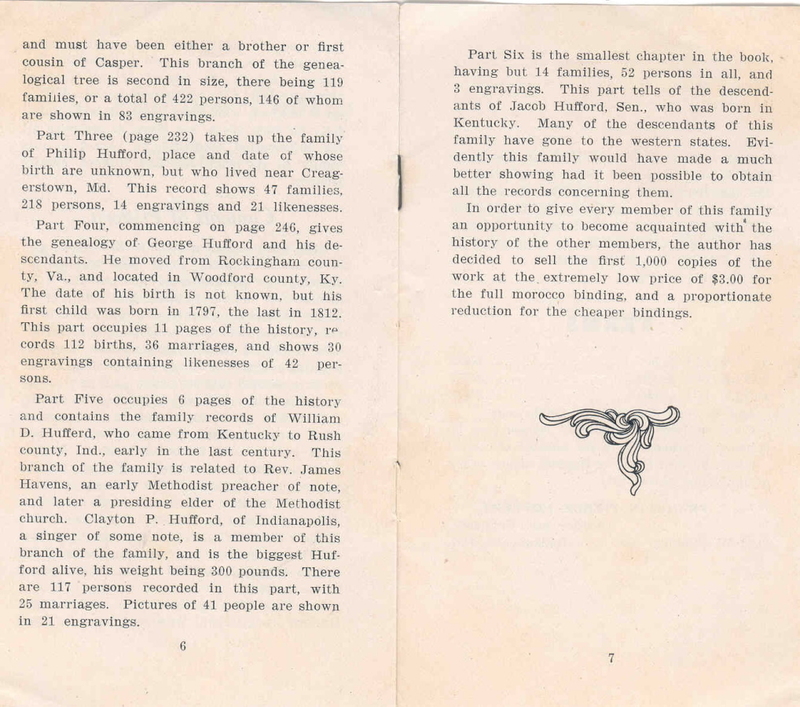 Download the 1909 HUFFORD FAMILY HISTORY from DropBox. 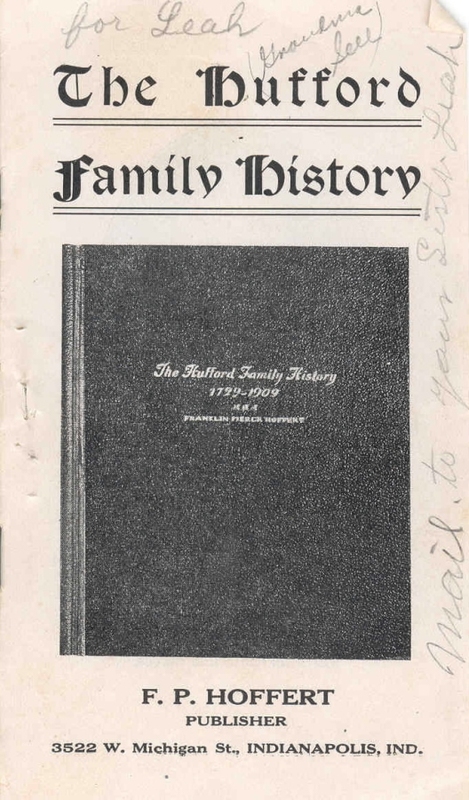 Reader’s Guide to 1909 HUFFORD FAMILY HISTORY. Download Alice Beard’s HUFFORD gedcom file. Audio/video clip of Schwaigern church bells, 2009: This is a 22-second clip showing the Lutheran church in Schwaigern, Germany, the very church where the records of Christian and his ancestors are found. The church bells are ringing clearly. The audio/video clip is from Christian’s descendant Jim Hufferd. Christian’s DAR information: Christian’s DAR Ancestor Number: A-056231. Information on page 4 is incorrect. The author of the book mixed up Christian with his father. Christian was about 13 years old when he traveled from Germany to Philadelphia, Pennsylvania. Christian traveled with his parents, Hans Jorich HOFFART and Anna Margeretha MOST. Also, there is no indication that Christian’s Hufford’s parents ever were in Swartzenau. They were from Schwaigern, Germany. Of interest to researchers working some of the descendants of Christian (b. 1716) will be Paxson Link’s “The Link Family: Antecedents and Descendants of John Jacob Link, 1417-1951,” published in 1951. It traces the descendants of John Jacob Link who was born in 1682 in Grossgartach, Germany. All descendants of Catherine CREAGER (b. 1799) and her husband Daniel LINK (b. 1772). Catherine was the daughter of Christina HOFFART (b. 1749), who was the daughter of Christian HOFFART (b. 1716). All descendants of Peter BEARD (b. abt 1781) and his wife Katherine LINK (b. 1792). Peter was the son of Anna Margareth HOFFART (b. 1754), who was the daughter of Christian HOFFART (b. 1716). Abraham Hufford (1836-1920): Abraham found addresses of most of the living Hufford descendants in preparation for the first Hufford family reunion, held September 22, 1898, in Rossville, Indiana. 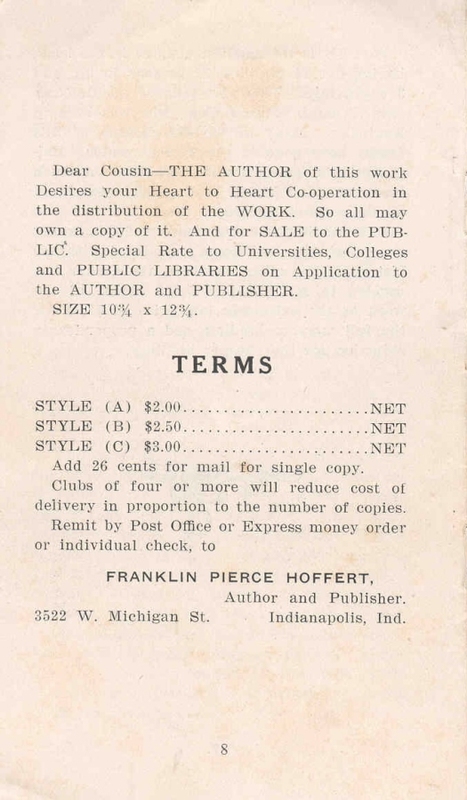 That contact information was used as the basis of the 1909 HUFFORD FAMILY HISTORY. 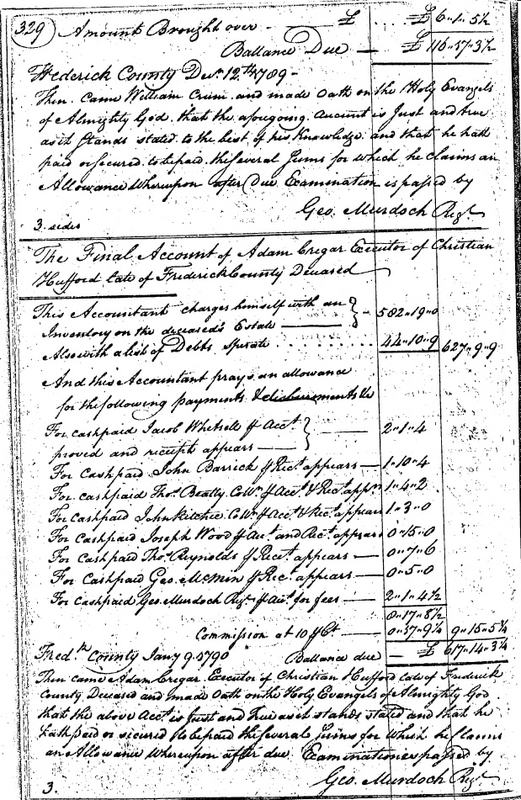 Descendant of Christian’s son Casper; Abraham is at page 142 of the book. Franklin Pierce Hoffert (1858-1931): Franklin authored the 1909 HUFFORD FAMILY HISTORY. 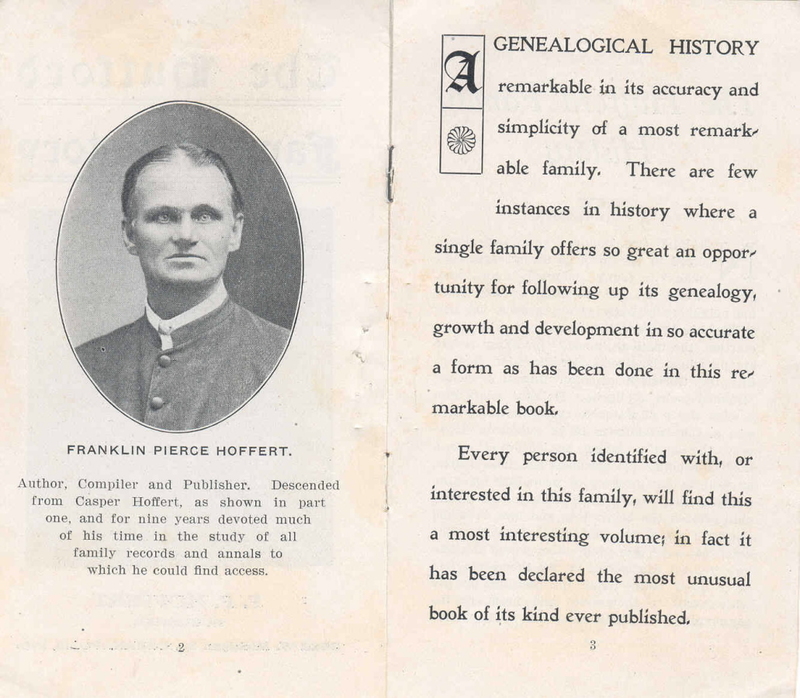 Descendant of Christian’s son Casper; Franklin is at page 52 of the book. Donald Robert Singleton (1918-1995): Donald sorted many of the descendants of Christian’s son Daniel. Donald’s work was preserved in a book of typed pages, collected in a notebook and dated August 3, 1976. Descendant of Christian’s son Daniel. Florence Lucille Grove (Mrs. Woods) (1936-1991): Florence edited “Hufford Family Research and Records,” a quarterly newsletter for Hufford genealogists that appeared in 1983 and 1984. It included information from wills, land records, estate settlements, county marriage records, etc. Descendant of Christian’s son Casper. 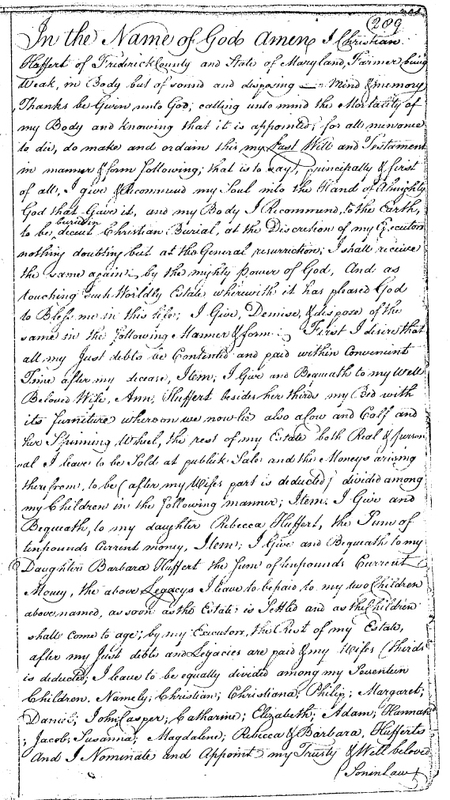 Barry Wood, Attorney: Barry figured out (in about 1970) that the Christian Hufford whose will was proved in Frederick County, Maryland, on October 8, 1788, was the same person who was born January 5, 1716, in Schwaigern, Germany. Barry has sorted out thousands of Hufford descendants using primary sources. Descendant of Christian’s son Christian II. Shirley Ann Hufford (Mrs. Hegeman) (1929-2013): Shirley discovered the identity of the first wife of Christian Hufford (Elizabeth Keim). Shirley sorted out thousands of Hufford descendants. She was a legal secretary and a DAR genealogist. Descendant of Christian’s son Philip. Eunice Elmina Newbold (Mrs. Clark) (1918-2016): Eunice authored the 1995 book SIX AMERICAN COLONISTS AND THEIR DESCENDANTS. Descendant of Christian’s son Daniel. Excellent work, Alice. I would like also to give a nod to Josef Schurr, the German researcher who submitted family group sheets on the Hoffarth families of Schwaigern to the Family History Library in Salt Lake City, where I found the sheet on Hans Jerg Hoffarth. I subsequently met him in Benton City, Washington, where he was staying with his married daughter. Quite a coincidence that he should turn up just a few minutes’ drive from my home in Richland, Washington. Separate subject — I’m not sure whether you have seen the discussion of Schwaigern history at http://www.mace-b.com/family/mindli.htm, but I thought it made an interesting read.